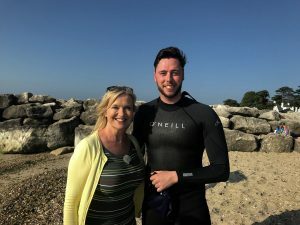 On a sunny morning in June, DCASA members tuning into the BBC Breakfast television programme were surprised to see Avon Beach in Mudeford and open water swimmers from Christchurch club Seagulls SC playing a starring role. Having received a last minute call from the BBC the previous evening, Head Coach Martin Littlefair and a few of the club’s open water swimmers turned up to provide “local interest” and chat to weather presenter Carol Kirkwood which was then followed by an early morning swim in a mirror-flat sea. The live broadcast was made in front of hundreds of thousands of viewers, but with only a handful of local dog walkers on Avon Beach. Weather presenter Carol Kirkwood continued to deliver live weather forecasts from the beach’s golden sands throughout the morning. Left: Seagulls Head Coach Martin Littlefair with BBC weather presenter Carol Kirkwood. Below: (l-r) Simon McLaughlin, Zak Dunning, Carol Kirkwood, Martin Littlefair and Seagulls Chairman David McWilliam.